Summary: In March 2012, Mali’s President Amadou Toumani Toure was overthrown in a military coup. The coup, combined with other crises in North Africa, notably the violent overthrow and killing of Libyan leader Muammar Qadhafi, led to a resurgence in militant activity in the Mali, culminating with a combination of Islamist and ethnic Taureg insurgents rapidly taking over considerable portions of the country. The Malian military, upset at the response by the government, seized power, only to discover that they were equally ill prepared to stabilize the situation. As the crisis in Mali grew during 2012, the United Nations Security Council eventually authorized the deployment of an African-led peacekeeping force in December 2012. The goal of this force would be to to stabilize the situation and allow for space for the parties to negotiate a settlement. Delays in preparing African forces, to be drawn from members of the Economic Community of West African States (ECOWAS), led to the decision by France to mount an immediate intervention in the country. France’s Operation Serval began on 11 January 2013, at which time the United States had already been engaged in intelligence sharing as part of the planning process. France also called upon the US to provide military airlift and other logistics support for its intervention. The US subsequently codenamed the effort to support France’s Operation Serval and the deployment of ECOWAS’ African-led International Support Mission in Mali (AFISMA) as Operation Juniper Micron. To this end, US Africa Command (AFRICOM) exercised the Global Response Force Execute Order (GRF EXORD) to request capabilities from each of US Transportation Command’s (TRANSCOM) Joint Enabling Capabilities Command’s (JECC) subordinate joint commands to fill operational planning, public affairs, and communications gaps. The JECC was a critical component of the GRF EXORD and was ready to deploy joint, mission-tailored packages anywhere in the world within hours of notification, to help the joint force establish the ability to command and control emerging operations. Just hours after receiving AFRICOM’s request, 12 Joint Planning Support Element members, 6 members of the Joint Public Affairs Support Element (JPASE), and 2 communications experts from the Joint Communications Support Element (JCSE) departed for AFRICOM headquarters in Stuttgart, Germany, where they formed a Joint Planning Support Element (JPSE). AFRICOM’s employment of the JECC under GRF EXORD authorities not only demonstrated the effectiveness of this type of request process, but validated the value of the JECC’s full range of capabilities in support of an emerging mission. Upon arrival at AFRICOM headquarters in Stuttgart, Germany, the 12 JPSE members embedded with the AFRICOM Fusion Center (J33/J35). With a comprehensive background in applying the Joint Operation Planning Process for multiple geographic combatant commands, JPSE’s expertise was integral to conducting the mission analysis and development of the Operation Juniper Micron Operational Design and Operations Order. As the planning environment changed, US Army Africa (USARAF) was designated as the supported component commander for Operation Juniper Micron and tasked to stand up Joint Task Force – Juniper Micron, which was responsible for synchronizing all Department of Defense efforts in support of French operations in Mali including the intratheater airlift, air refueling, and intelligence sharing mission sets. Six JPSE members were re-directed to USARAF headquarters in Vicenza, Italy, to provide continued joint planning expertise. As requirements evolved, 4 JPASE members traveled to Istres Air Base, France to support US Air Forces, Africa Public Affairs, the designated component headquarters coordinating the air requirements of the Operation Juniper Micron mission sets. These JPASE members were charged with a variety of joint public affairs tasks including coordination and facilitation of press briefings and media training, as well as providing the main source of imagery collection. While AFRICOM controlled the operation from its headquarters in Germany, on 21 January 2013, the initial airlift mission involved transporting French soldiers and military equipment directly from Istres-Le Tubé Air Base in France to Bamako, the capital of Mali. The first operation in January 2013 involved a C-17 Globemaster III cargo aircraft, operating under the control of US Africa Command (AFRICOM), being tasked with moving a French mechanized infantry battalion. The C-17, which arrived from Dover Air Force Base, Delaware, took off from France and landed in Bamako on 21 January 2013 to deliver more than 80,000 pounds of equipment and dozens of French soldiers. 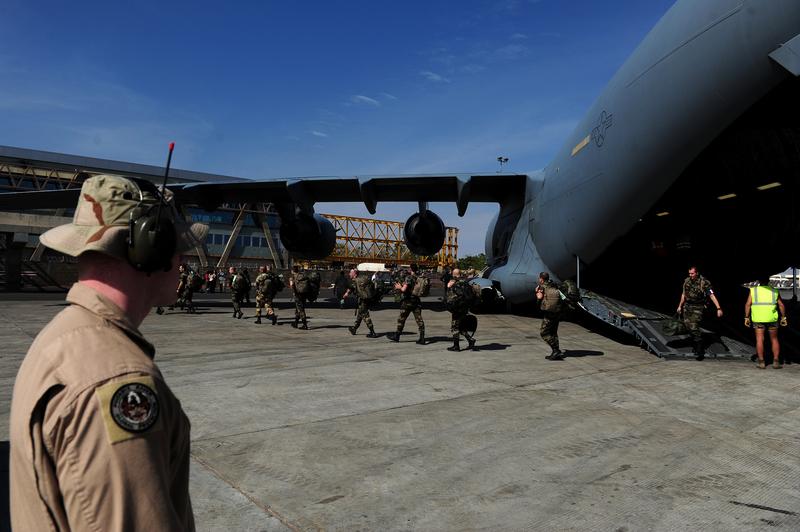 French soldiers depart a U.S. Air Force C-17 Globemaster III in Bamako, Mali in January 2013. The US provided airlift and other support for French forces in Mali as part of Operation Juniper Micron. The 621st Contingency Response Wing based at Joint Base McGuire-Dix-Lakehurst, New Jersey was the lead element in the airlift efforts for Operation Juniper Micron. However, while the 621st Contingency Response Wing was designed to single-handedly deploy, establish an airfieldm and manage air mobility operations, its planners only deployed at Istres to coordinate air support for the French military movements and load the US Air Force cargo aircraft. In addition, while the Wing presented a mobile capability, it did not have organic aircraft, requiring support from the US Air Force’s 87th Air Base Wing and 305th Air Mobility Wing to facilitate the deployment process. Furthermore, the aircraft tasked with supporting the operation were allocated by the 618th Air an Space Operations Center (Tanker Airlift Control Center) at Scott Air Force Base, Illinois, while the 621st Contingency Response Wing also remained otherwise on alert to provide any further requested support, and their airmen continued to support airlift missions in Europe and Africa. By 5 February 2013, more than 100 Airmen from the 621st Contingency Response Wing were supporting airlift missions transporting French soldiers and military equipment from Istres to Bamako in support of Operation Juniper Micron. 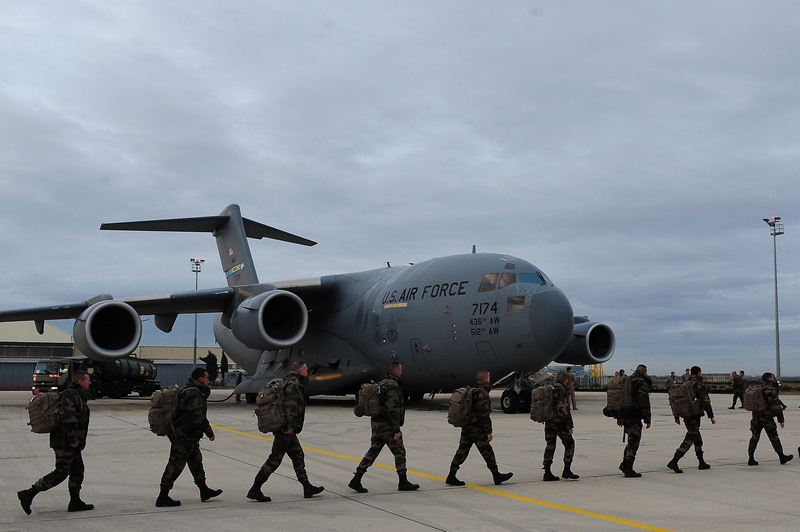 French soldiers march to a U.S. Air Force C-17 Globemaster III at Base Aerieene 125, Istres, France on 20 January 2013, as they prepare to depart for Mali as part of France’s Operation Serval. As of 27 January 2013, the US Air Force had flown 17 C-17 Globemaster III sorties, moving more than 391 tons of equipment and supplies and nearly 500 French personnel into Bamako. On that date, the United States also began providing aerial refueling support for French operations. Only one refueling mission had been conducted by that time, when a KC-135 Stratotanker provided about 33,000 pounds of fuel to French fighter aircraft. More refueling missions were expected to take place, however. On 11 February 2013, President Barack Obama issued a presidential memorandum stating that pursuant to the authority vested in him by section 506(a)(1) of the Foreign Assistance Act of 1961, as amended, 22 U.S.C. 2318(a)(1)(the “Act”), he had determined that an unforeseen emergency existed that required immediate military assistance to Chad and France in their efforts to secure Mali from terrorists and violent extremists. Furthermore it was determine that these requirements could not be met under the authority of the Arms Export Control Act or any other provision of law. Therefore, President Obama had directed the drawdown of up to $50 million in defense services of the Department of Defense for these purposes and under the authorities of section 506(a)(1) of the Act. The Secretary of State was authorized and directed to report this determination to the Congress, arrange for its publication in the Federal Register, and coordinate the implementation of this drawdown. On 12 February 2013, the Air Force reached a major milestone when the service hit the 2 million pounds of cargo transported mark during airlift operations from Istres, France to Bamako, Mali and other partner nations in support of French military operations in Northern Africa as part of Operation Juniper Micron. Delivering 2 million pounds of cargo in just 23 days is quite an achievement. By 15 February 2013, the Air Force had flown 43 missions under the control of AFRICOM. In addition to the cargo total, C-17 Globemasters from the 62nd Airlift Wing based at Joint Base Lewis-McChord, Washington and the 436th Airlift Wing based at Dover Air Force Base, Delaware, staging from Istres, had also transported 830 French military personnel to Mali. By March 2013, 93 missions supplying 5.3 million pounds of cargo had been flown in support of Operation Juniper Micron. This included some 220 individual sorties responsible for delivering 1,630 passengers and 2,639 short tons of cargo. It was unclear whether the US continued providing support to MINUSMA after the bulk of the forces deploying in support of the operation had arrived and the situation had stabilized to a degree by late 2013. It is known that the Pentagon initially agreed to help the French military through the end of August and that the US was prepared to extend that assistance if asked by France. However, according to an article in Air Force Magazine, no such request had been filed by October 22nd. A Stars and Stripes article in January 2014, citing Department of Defense spokesman Major Robert Firman, said that the US expected the mission to continue into the new year, but hopefully slow down as French forces continued with their planned withdrawal from the country. Even with the improvements in the situation by the end of 2013, much of the country remained an “ungoverned space,” where the Malian government exercised little control. 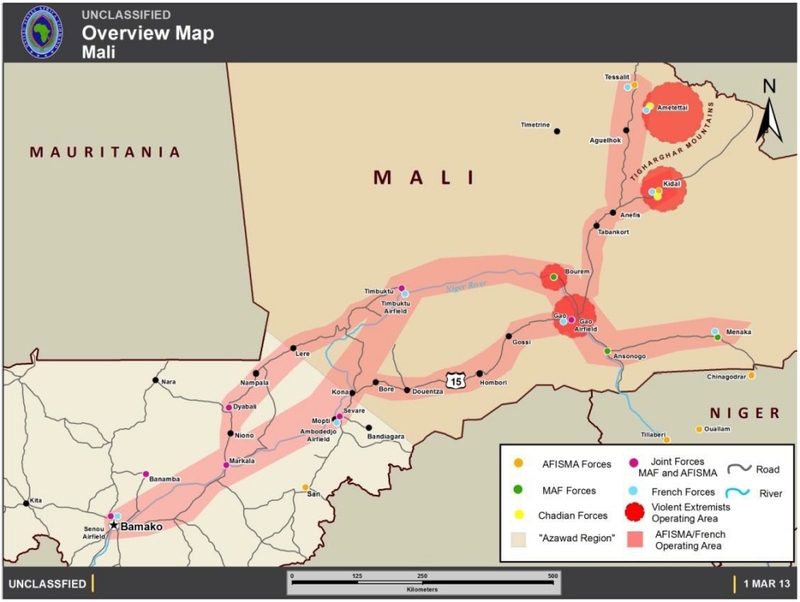 A map released by AFRICOM of the area of operations in Mali as of March 2013 showed that government control extended mainly to the country’s very limited lines of communication.